Public policy affects a company’s ability to meet customer needs and provide shareholder value. To enable policy interventions in a combined effort, we have decided to build a Public Affairs format within SCCI’s Communication Forum. This will enable us to work together on Advocacy and Public Affairs to leverage the impact of Swedish companies operating in specific sectors, working closely with government initiatives. The ambition is to navigate the intersection of the market, governments, policy, politics and public opinion to enable policy interventions to meet business demands. 1. 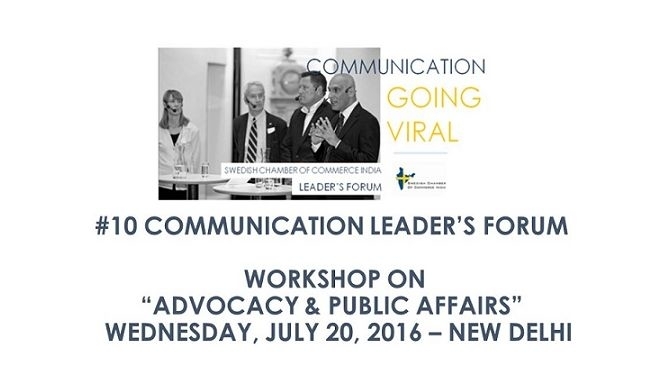 Build a combined agenda to engage with public policy stakeholders in a compelling and effective ways. 3. Identify stakeholders and entities essential to achieve outcomes and generate the scenario needed to successfully promote the message to critical audiences. SCCI invites you to the 10th Communication Forum and the first workshop where we would set the team and the outcome needed. In the current Indian scenario the government has various initiatives that could be used as leverage to build an advocacy and engagement plan. An early discussion was around sustainable development and building engagement with government to share the specific work by Swedish companies on waste. We need to further discuss the same and find the most common area of collaboration and advocacy need. Once identified we would set the collaboration and work towards planning and activities.